A successful commercial is no easy task, but what a value it is when it can deliver your message to an audience and entertain as well. Humor seems to always appeal to the masses, and the new Zappos commercial successfully calls attention to the company by creating the perfect juxtaposition of funny puppets speaking over the phone and cleverly incorporating a customer service message. The best commercial is one that can be viewed over and over and still elicit the same laugh. The fine line between creativity and communication makes the message memorable. The offbeat humor fits the quirky culture of Zappos. After all, CEO Tony Hsieh encourages his customer service representatives to make a Personal Emotional Connection. 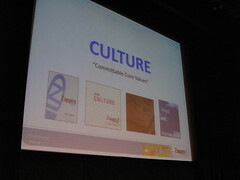 The culture of the company is what the company is all about, and as new employees train with two weeks of classroom training and two weeks of practical knowledge answering customer calls, they are offered money to the tune of $1000 to quit if they feel they do not fit with the culture. Employees who decide to stay within the company are much more invested in their loyalties, and with Hsieh’s mission which is to “provide the best online experience possible,” employees are better able to think independently in order to achieve the goal. Every year each employee is required to write a short essay about the culture of the company. All of the writings are entered into an unedited book and distributed to the staff. It is a place where employees want to come to work. This same commercial that has probably made all of you smile by now was able to communicate who Zappos is, what they want you to do and makes you want to do it. If Hsieh can encourage managers to goof off with his staff for 10 to 20% random time, have interviews over “vodka shots,” and paint the bathrooms “urine colors” just to be weird and funny, two very unusual puppets extolling the virtues of an unusual customer service phone call can only add to the uniqueness of a tremendously successful company. The puppets bring home the concept of being humble, having fun and being a bit weird. It’s Hsieh’s mantra, “Deliver WOW through service.” The video is after the jump.